MILES: HOW MANY? 11 on the elliptical. Which I equate to…oh, 8 miles running, as calculated by the “because-I-flippin’-say-so” calculator. WHERE TO: The gym at work. A little 2-foot by 3-foot space therein. GUY: Doctor, my finger is broken. GUY: <through tears of anguish> Why did you do that? DOCTOR: Your finger doesn’t hurt anymore, does it? Well, I am both the psychopathic doctor and hapless patient in this scenario, in the sense that the frostbite rubbing against my pants all day makes me wonder if it’s actually the joint that hurts or if it’s just the skin. Which is strangely comforting, because if I can’t tell, the injury couldn’t be that bad. Anyway, the knee feels strangely not-that-bad right now and didn’t even twinge on the walk home from work, even when I jogged across a couple of streets to avoid homicidal DC drivers. Hoowah! Hope! WEATHER: Warming up — 32ish! MOOD: Chipper but feeling a cold coming on. My run this morning was wonderful. Yay! But today we have more important matters to tend to. Because today, dear readers, we celebrate new runners everywhere by wishing good luck to a lovely woman (and this blog’s top commenter) who I will simply call The Bear (which has much more to do with her little commenter icon than her looks) (which are SMOKIN’ and not at all bear-like). You see, The Bear is running her first race this weekend — P.F. 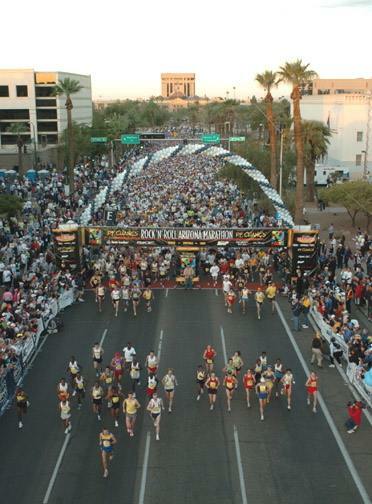 Chang’s Rock ‘n’ Roll Half-Marathon in Phoenix, Arizona. And as she is a dear friend and a truly wonderful person, I have composed a poem for The Bear…13 lines in length, even, to propel her though 13 miles of sheer Arizonan sunny BLISS! Because you’re not a guy. When you run P.F. Chang’s.